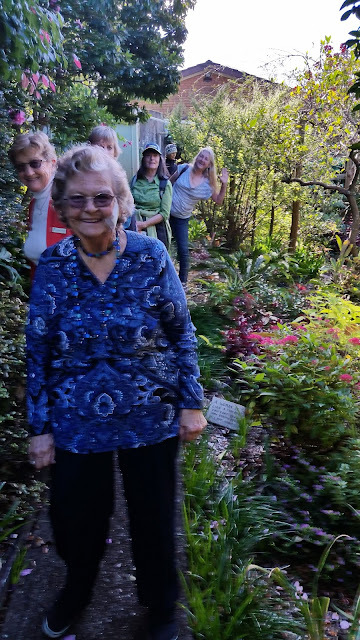 Coffs Harbour Garden Club: What a Day for an Outing! The first day of winter? Really? You'd never know it, as it was a very balmy 19 degrees on the Coffs Coast and a picture perfect day to visit two large gardens. The first Thursday of each month, Coffs Harbour Garden Club go on an outing to visit gardens or places of interest that appeal to the membership. This month it was the Northern Beaches region of Coffs that had the members travelling to. Currently we have an Outings Committee of TWO very dedicated ladies who liaise with the destination owners on the optimum time for members to visit. There is great satisfaction to be found in our local gardens and gardeners. Take for instance Peg (pictured left in blue) who delights in her garden and it brings much joy to her. 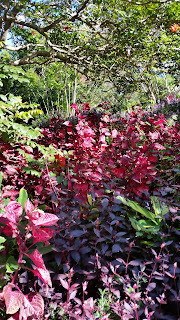 She gets such a thrill out of sharing her garden with other people and delights in visits from garden clubs and groups. The gardens may not necessarily be large gardens (like the two this month) but each one has a uniqueness to offer the visitor. 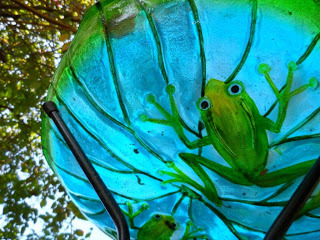 'Members had a special treat this month in visiting Margaret's sprawling garden and museum. The museum was her husband's special project. He had been collecting pub memorabilia and amazing porcelain for many years. What an incredible display. 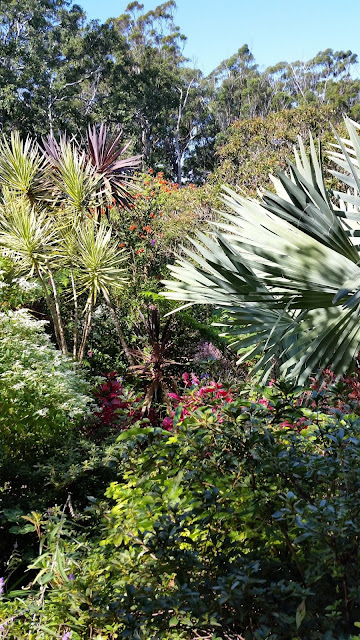 Margaret's garden is wild and rambling with so many plants, many rare, that a person could spend hours wandering around. A second look would also yield more that had gone unnoticed the first time around. Amazing roosters, chooks, guinea pigs and rabbits also share this garden. Margaret F. is quite adept at coaxing plants that may not necessarily be entirely suited to the Coffs Subtropical environment. 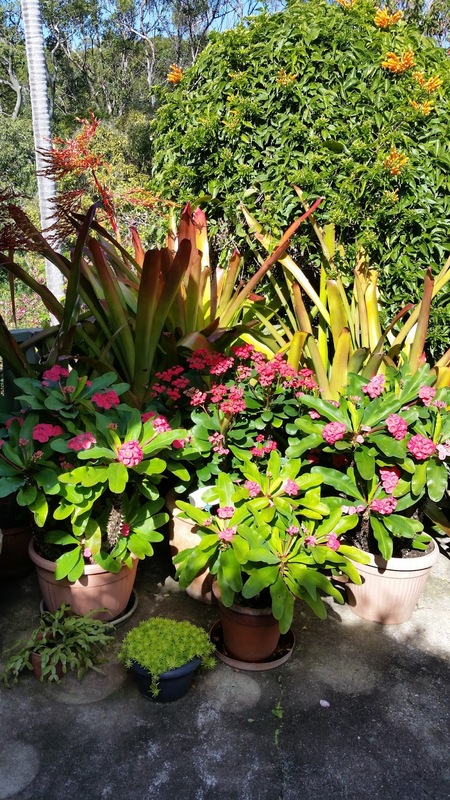 Members were very interested in seeing the unusual plants she has collected and successfully grown over the years. It is amazing to see different ideas, methods, design, landscaping materials etc etc on the outings. Every time there is something of interest that we take away from each visit. Take, for example Peg's use of this neat pot stand which has been repurposed from a saucepan stand, just brilliant! 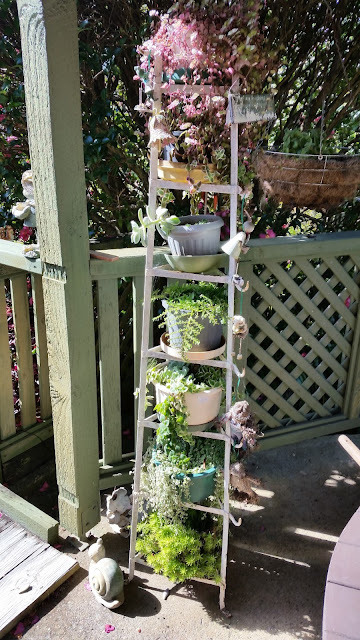 Peg has such a vast collection of pots and just can't resist striking cuttings from friends - this lady most certainly has a green thumb and you will see pots abounding in her garden - especially on the level area at the rear of her home. The herbaceous border plantings were full of wonderful colour, visual texture and vigour. The mature trees do afford these plants some protection during the hot summer months but now they have come into their own, showing off their unique form and colour. This path beckons the visitor to explore the next vista - such a wonderful space. Indeed members were able to amble along at their own pace and not really be aware that there were other visitors to this garden. The borrowed landscape of the tall eucalypt trees in the background make for a stunning backdrop for some subtropical plants. The Euphorbia 'Diamond Frost' gives a wonderful froth of white too. 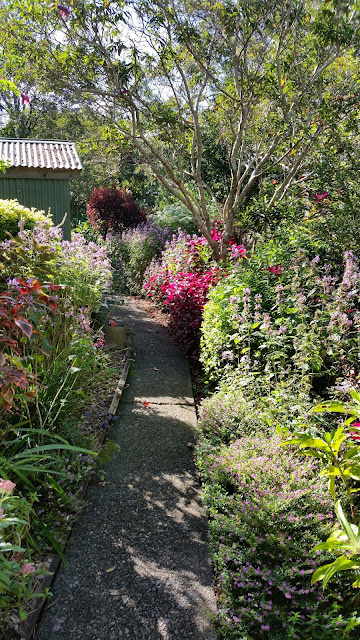 If there is a garden you know that the CHGC membership could visit please let either Pat R. or Marg F. know so they can negotiate a suitable time to visit. It is always a difficult task to come up with ideas for visits. Indeed if there are any members who would like us to visit that'd be great too. 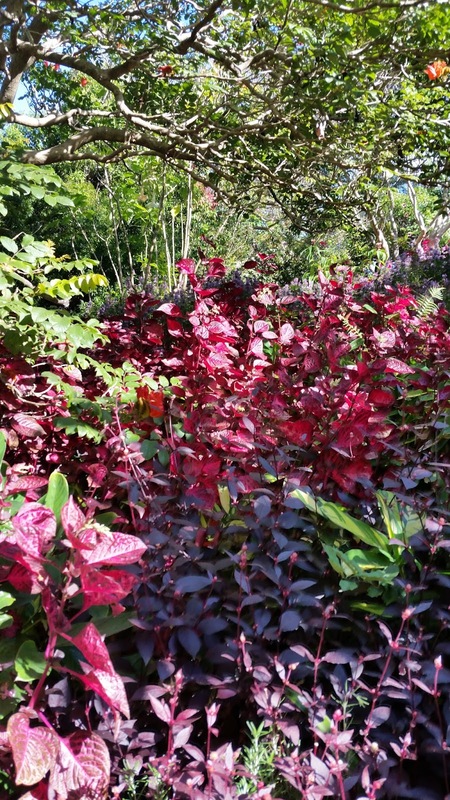 The burgundy foliage takes the place of more traditional flowers to bring a shot of colour to this garden. 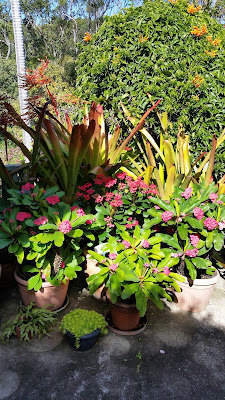 A collection of Eurphobias and bromeliads really works wonderfully well. Thank you once again for the Outing Committee for providing two wonderful gardens to visit once again. 'Next we enjoyed a well-deserved lunch at the Woopi pub on the hill. A great day out.